By becoming a NINA brand member you demonstrate your support of jobbers, installers and consumers all across America. Jobbers and consumers support the brands that support them! Start getting consumer leads from NINA. Send installations to local installers. Use the NINA label on the sides of your packaging. 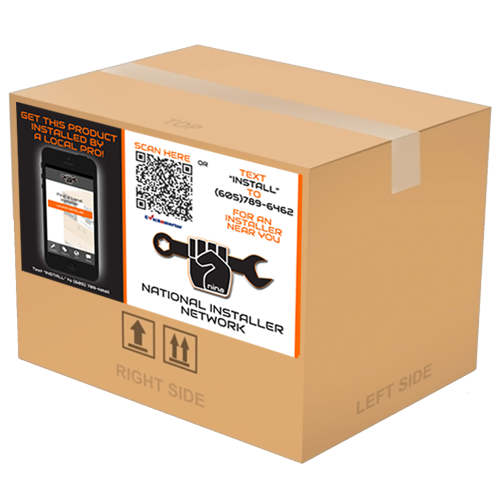 Consumers will scan the label or text the word “install” to the number on the label, which will automatically connect them with a professional installer in their area. As a NINA brand member, you’ll be able to produce coupons for your brands products. These coupons will be promoted through every NINA label in the world. Whenever any consumer uses the NINA label to find a local installer, your coupon will be offered to them, regardless of what brand they purchased, or where it was purchased.